The de Havilland DH.112 Venom was a British postwar single-engined jet aircraft developed from the de Havilland Vampire. It served with the Royal Air Force as a single-seat fighter-bomber and two-seat night fighter. The Venom was an interim between the first generation of British jet fighters – straight-wing aircraft powered by centrifugal flow engines such as the Gloster Meteor and the Vampire – and later swept wing, axial flow-engined designs such as the Hawker Hunter and de Havilland Sea Vixen. The Venom was successfully exported, and saw service with Iraq, New Zealand, Sweden, Switzerland and Venezuela. The Sea Venom was a navalised version for carrier operation. The Venom's lineage lay in the aircraft it was intended to replace, the Vampire, which had been the second jet aircraft to enter service with the RAF. 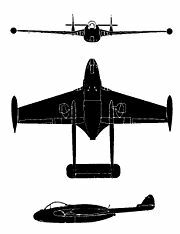 In 1948, de Havilland proposed a development of the Vampire with a thin wing and more powerful engine as a high alitude fighter, the DH.107, Vampire FB.8. In most respects, the Venom was quite similar to the Vampire, sharing the distinctive twin-boom tail and composite wood/metal structure, although the Venom differed in parts. The idea was adopted and a Vampire F.1 was converted by fitting the new de Havilland Ghost engine, which was more powerful than the de Havilland Goblin used on the Vampire. As the DH.112, the Venom filled an Air Ministry requirement for a fast, manoeuvrable and capable fighter-bomber to replace its progenitor. The first Venom prototype flew on 2 September 1949 and the first Venom variant, a single-seat fighter-bomber, entered service in 1952 as the FB 1. 375 of these would be built. It was armed with four 20 mm (.79 in) Hispano Mk V autocannons in the nose and could carry either two 1,000 lb (approx 450 kg) bombs or eight RP-3 60 lb (27 kg) air-to-ground rocket projectiles – the heavier bombs being an improvement over the Vampire FB.5. It was powered by a single 4,850 lbf (21.6 kN) thrust Ghost 48 Mk.1 engine. The next Venom, the NF.2 night fighter, first flew in 1950 and entered service in 1953, having been delayed after some minor problems with the type. To accommodate the necessary two man crew (pilot and navigator/radar operator) it was structurally different – the two crew were positioned side-by-side and an airborne interception radar was fitted in the nose. It replaced the Vampire NF.10, and was followed by NF.3, which was the last night fighter variant of the Venom, first flying in 1953 and entering service in 1955. It had a relatively brief career with the Royal Air Force, having been only an interim solution, and was withdrawn in 1957 and replaced by the Gloster Javelin twin-engined all-weather fighter. The final Venom for the RAF was the single-seat FB.4 which first flew on 29 December 1953. It entered service in 1955 and 250 were built. It was powered by a single 5,150 lbf (22.9 kN) thrust de Havilland Ghost 105 turbojet engine. It also received an ejector seat and some modifications to its structure. The RAF fighter-bomber Venoms saw service during the Malayan Emergency which took place between 1948 and 1960, although they did not begin operations until the mid-1950s with Nos. 45 and 60 Squadrons RAF. While there, the Venom supported operations against Communist guerrillas as part of Operation Firedog, the codename for Royal Air Force operations in Malaya. Venoms were lent to the Royal New Zealand Air Force for use in the same conflict where they operated with No. 14 Squadron RNZAF. The Venom also saw service during the Suez Crisis being operated by Nos. 6, 8 and 249 Squadrons RAF flying from RAF Akrotiri, Cyprus. The Anglo-French invasion, codenamed Operation Musketeer, took place in response to the nationalisation of the Suez Canal by Egypt's leader, General Nasser. The air war began on the 31 October 1956 signalling the beginning of the Suez War. The Venoms launched a number of sorties, attacking a variety of military installations on the ground. They also saw much action in the Middle East, supporting operations against terrorists in Aden and Oman, losing some aircraft in the process. Venoms additionally saw service during the Mau Mau insurgency in Kenya. All Venoms in RAF service were withdrawn from first-line service in 1962, having proven their worth in a variety of locations across the world, in peace and war, and in some of the most difficult climates the RAF has ever faced. The last non-RAF Venoms to leave active service were Swiss Air Force Venoms which retired in 1983. About 20 Venoms continue to fly as of 2004, performing at various air shows, while a number of examples are preserved in museums in the United Kingdom and abroad, in non-flying, static display condition. - NF.2 - Two-seat night fighter, an interim night fighter developed from a planned export for Egypt. 91 produced. - NF.2A - Modified NF.2, which received some strengthening improvements to the wing spar after problems, that had led to a number of accidents, had been found with the NF.2 and other Venoms. - NF.3 - Modified NF.2, including the fitting of ejector seats, the Ghost 104 engine, a new (American) radar which led to the NF 3's nose being slightly altered. 123 produced. - FB.4 - Final Venom for the RAF, single-seat fighter-bomber. Ghost 105 engine, ejector seats and structural modifications. 250 built. - FB.50 - Export version used by Iraq and Switzerland in the 1950s. 15 Built. - NF.51 - Export version of the night fighter. A total of 60 were purchased by Sweden and used under the designation J33. It served 1953–1960 at the dedicated night fighter F1 wing at Västerås. - FB.54 - Export version. Used by Venezuela and Switzerland in the 1950s. 22 built. The Venom has been preserved in significant numbers, thanks in part to their longevity with the Swiss Air Force. In the UK, a number of Sea Venoms are preserved, along with examples of the NF 3 and Swiss-built FB.50 and 54. In Sweden, two examples of the NF.51 are preserved. There are many survivors in Switzerland, and other Swiss aircraft are scattered throughout Europe. In Australia, a number of Sea Venom FAW.53s have also survived. Venezuela has the only complete surviving British-built single-seat Venom. Although the Venom was, for a time, a popular and cheap warbird, the number of airworthy aircraft is dwindling. Currently there are two in the UK that fly regularly, along with single examples in Switzerland and the USA. All are license-built Swiss examples. 1. "[3.0 DH Venom / DH Sea Vixen]" (html). Greg Goebel's in The Public Domain. http://www.vectorsite.net/avvamp_3.html. Retrieved 2008-05-05. 2. Gunston 1981, p. 52. 3. The Gloster Meteor was the first jet aircraft to enter service with the RAF, and saw service during the Second World War. - Green, William. The World's Fighting Planes. London: Macdonald, 1964. - Gunston, Bill. Fighters of the Fifties. Cambridge, UK: Patrick Stephens Limited, 1981. ISBN 0-85059-463-4. - Winchester, Jim, ed. "De Havilland Sea Vixen." 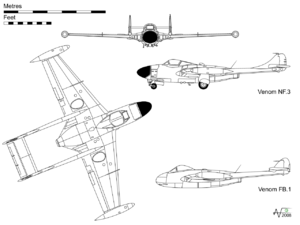 Military Aircraft of the Cold War (The Aviation Factfile). Rochester, Kent, UK: The Grange plc., 2006. ISBN 1-84013-929-7.